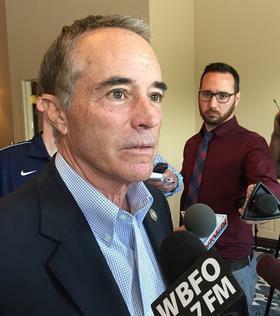 Congressman Chris Collins, who last week raised eyebrows by suggesting he would carry a gun following the shooting of a colleague, has again stated his intention to be armed during public appearances, not just for his safety but also for that of staff and constituents. The Republican renewed his intention in a column published Monday by the Washington Post. Collins spoke further of his concern for public safety during and after an appearance Monday afternoon at a lunch hosted by the Hamburg Chamber of Commerce. During the lunch, Collins spoke on topics including tax reform, the desire to repeal and replace Obamacare and other positions backed by the Trump Administration. But he opened his remarks by addressing last week's gunfire at a baseball practice attended by Congressman Steve Scalise, congressional aides and other Republican personnel. Collins praised Capitol Police for their actions and suggested that had it not been for there presence, the situation would have resulted in more bloodshed. "Let's face it, we had 18 members of Congress go play baseball off site and no one thought to call Capitol Police to have anyone come," Collins said. "Thank heavens Steve Scalise was there with two Capitol Police. If he had skipped practice, it would have been a massacre." Scalise, the House Whip, was serious wounded in the attack by a man Collins described as "deranged." Investigators say the gunman, 66-year-old James Hodgkinson of Illinois, had a list of desired targets. Scalise, who was shot in the hip, underwent additional surgery on Sunday but was said by hospital officials to be showing improvement. Collins, who has held a gun permit for three decades, was asked if he was armed at his appearance in Hamburg Monday. He would not say, one way or another, but he did confirm that armed undercover security officers were present. He added that members of the Livingston County Sheriff's Department were guarding an event he attended over the weekend. He was asked whether he has formally requested that other congressional personnel be trained by Capitol Police. That, the congressman said, would require legislation but he is working with gun rights advocates, including the National Rifle Association and Shooters Committee on Political Education, to increase armed protection. Collins' idea would be to let members of Congress carry a gun, as well as one staff member at the district office and one at the office in Washington, D.C.
"If I'm giving a speech and there's some guy waving a gun, it doesn't do much good unless there's somebody else that is armed, another good guy with a gun," Collins said. "That would have to be legislation because we'd be preempting state law." During the lunch and later with reporters, Collins spoke of the collective desire to tone down the hot political rhetoric that has led to violence. He blames social media and "the 24-7 news cycle" for fueling that rhetoric, which has led to the need to address safety concerns. He told guests at the lunch meeting that while there are sharp political differences between Republican and Democratic lawmakers on Capitol Hill, many are good friends. Copyright 2017 WBFO-FM 88.7. To see more, visit WBFO-FM 88.7.